No company can survive if the members of staff do not work together in unity. Team building activities are particularly designed in order to develop staff’s capacity to successfully together. A lot of the team games and initiative tasks are pretty much like children’s games, some other are quite novel and pretty complex and specifically designed for certain needs. Some complex initiative tasks can include night activities, rope courses and exercises that last for over several days. There are several work environments that need some form teamwork so that things can run smoothly and other workers will also be motivated to perform to the best of their abilities. Team building activities are generally utilised in order to build a relationship between colleagues. On the other hand a variety of work environments really desire teamwork but because staff work separately, this is really not feasible. Workers, who work in environments such as these, do require these team activities in order to assist them to relate with other staffs. They will be able to disseminate effectively and will all work towards achieving the goals and objectives of the company. You will be very shocked to find out that so many workers who work in the same company do not know anything about providing the “same” information to customers – which is a big problem! These team activities are most times used in presentations, workshops, meetings, education programs, training seminars and corporate training. The corporate world is not the only ones that the team building exercises are designed for, colleges, high schools, elementary, sports teams, correctional facilities, teacher training and so much more will benefit from this these group building activities. These group activities can be adapted for practically any type of setting, big or small, young or mature and across every single culture. One of the important aspects of team exercises is the participants’ discussion and reflection about the activity, how they were able to approach the problem and what they have learned from taking part in the activity. For instance, a group may be asked to roll a big cube through a path using certain tools. The grouped is videoed during the execution of the task and the video is viewed, assessed and discussed. The team will be able to learn what they have done wrong and the how fast they improvised when things were not going their way. 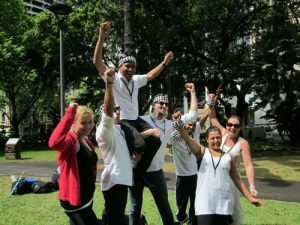 Sydney team building experts can come up with Innovative and exciting activities that are specifically tailored for the client’s type of business. The activities are safe and some will challenge you both physically and mentally. Read more About the Race in order to find out how your employees can benefit from the activities put together by a competent and reliable Sydney team building expert.